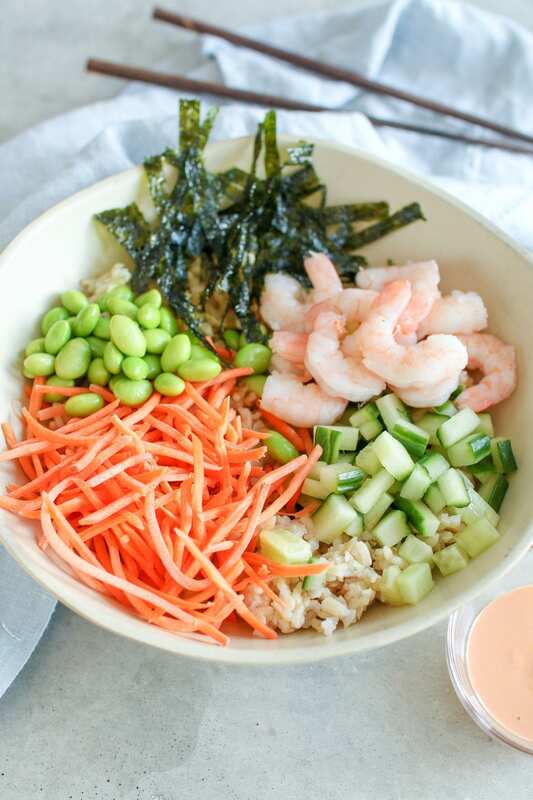 Get your sushi fix in this easy shrimp sushi bowl that’s ready in 5 minutes! 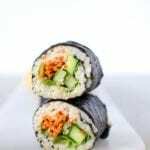 Who has time to roll their own sushi rolls these days? 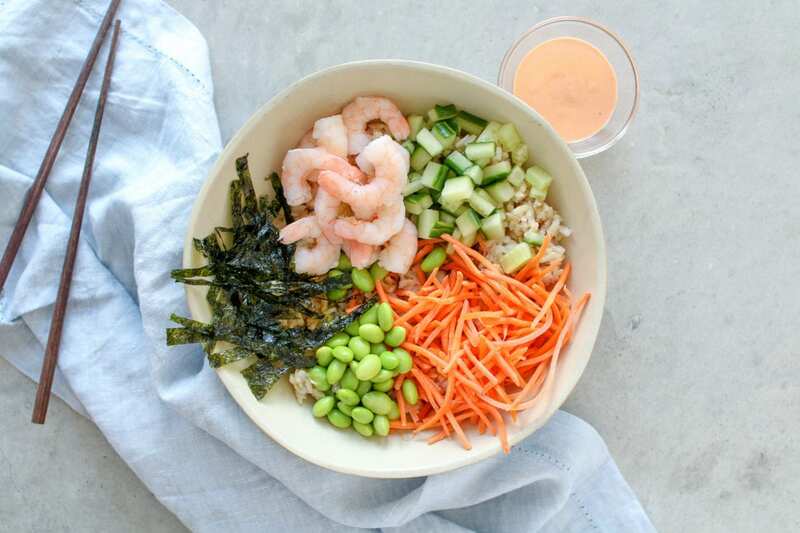 As much as it can be fun at times to have a “roll your own sushi” party, when it comes to preparing a quick lunch or dinner, it’s a lot easier to just toss everything in a bowl. Is is just me or does everything taste better in a bowl? 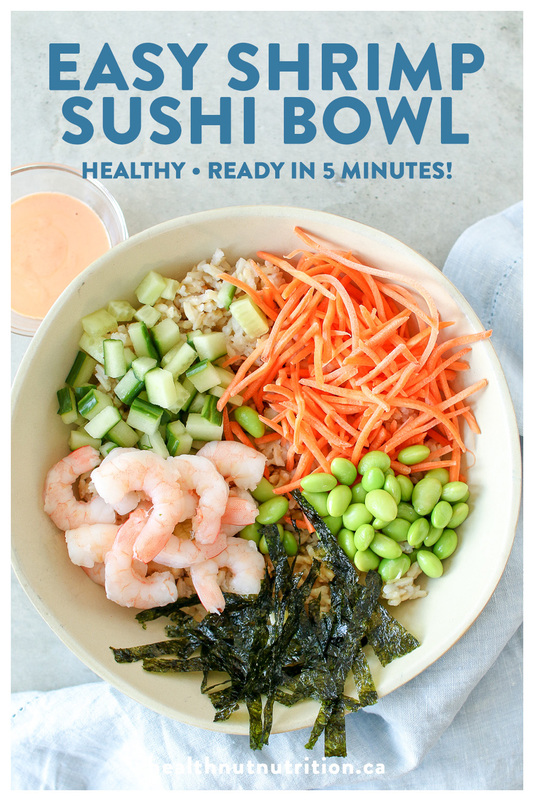 This is honestly the easiest sushi bowl you’ll ever make and it comes together in a matter of minutes. 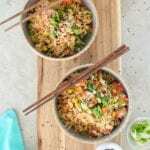 Of course as always, when making these quick meal recipes the key is to have some pre cooked grains like brown rice or quinoa prepped in your fridge ahead of time. Whenever I’m cooking rice or quinoa for a recipe, I always double the amount and store the leftovers in an airtight container in the fridge. This way it’s ready to go when I need to make a quick lunch or dinner. Now that we have the base out of the way, the rest is easy peasy. 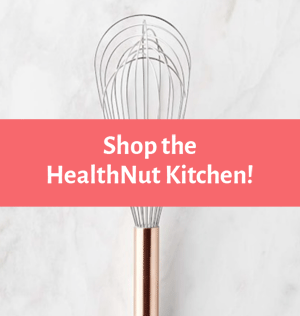 The ingredients I used in this recipe can easily be swapped for whatever you have on hand. 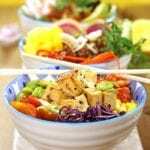 Once you have the concept down of a sushi bowl you can get creative and have fun with it. 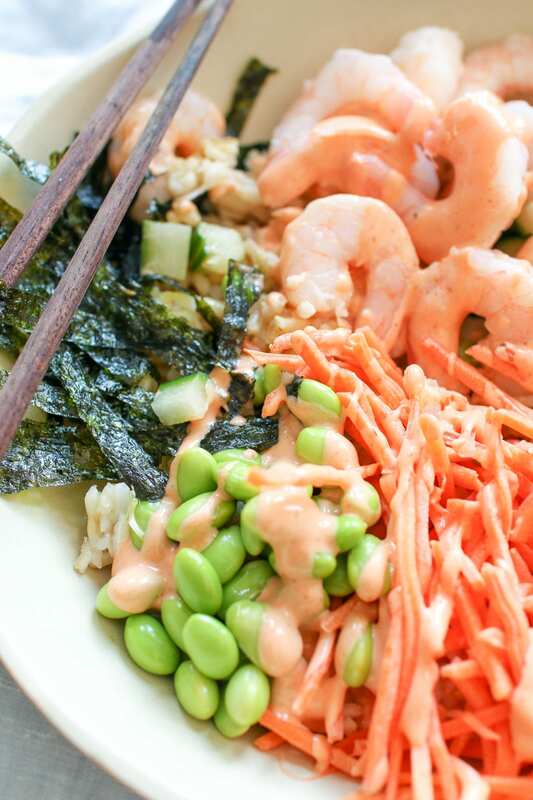 Swap the shrimp for ahi tuna, or tofu if you want to make it vegetarian. 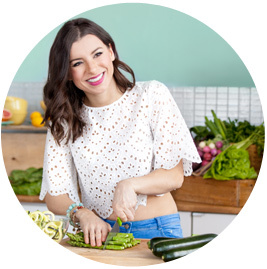 Switch up the veggies, try it with peppers, avocado, radish, mangoes, etc…there are no rules!! It’s all about making it colourful and adding a variety of textures and crunch. 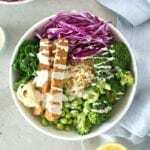 If you’re looking for similar recipes and love the idea of a sushi bowl, then you’re also going to love my How to Build the Perfect Poke Bowl recipe! 1. In a large shallow bowl, add the cooked rice and tamari. 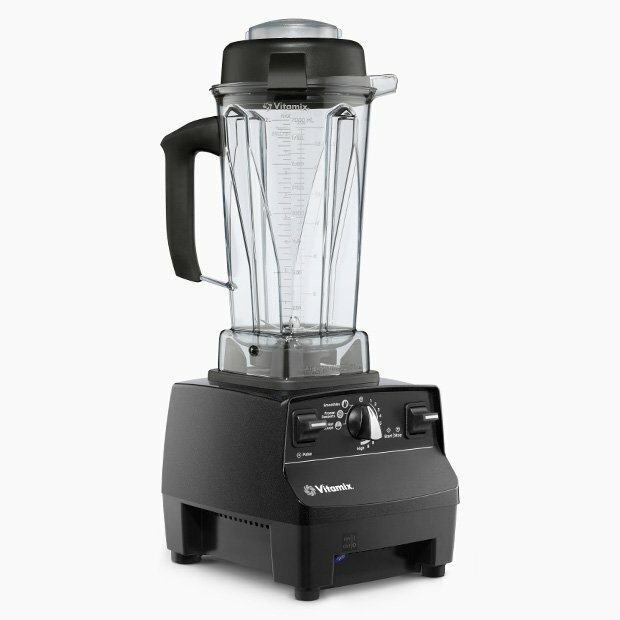 Give it a quick stir. 2. 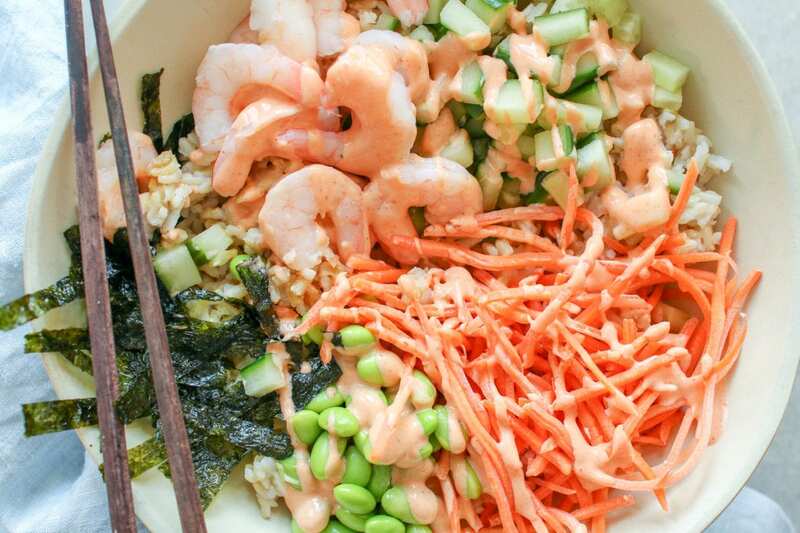 In a small bowl, combine the mayonnaise and sriracha and set aside. 3. 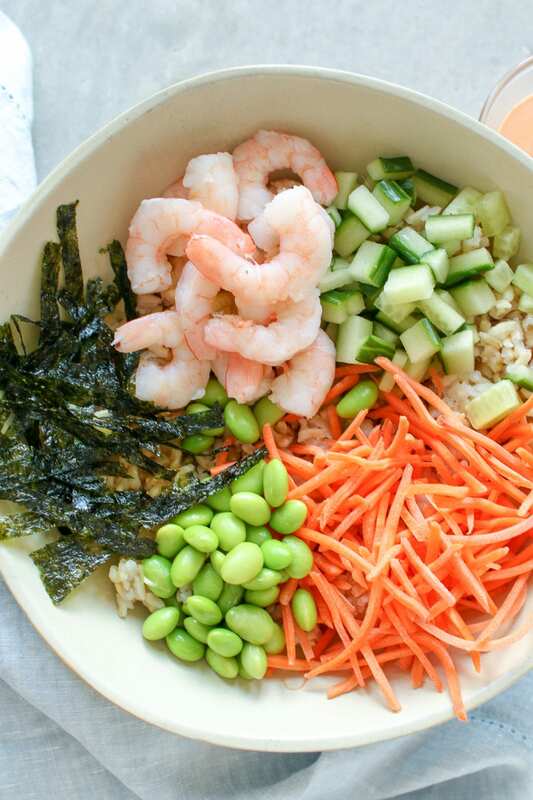 Arrange the shrimp, cucumber, edamame, carrots and seaweed on top of the rice. Drizzle with mayo/sriracha sauce on top and enjoy!